Now you see. Now you know. Now you can re-descend and guide who's still fighting for the peace. Only who see beyond illusion of diversity may win. Only a Warangel can defeat the war. Choose the race you want to play: all of them may win, with different tactics and strategies. It shall not be the victory of one race over others, but victory over the war iteslef. 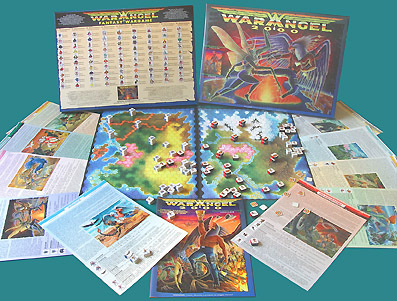 WARANGEL 2000 is a complete boxed game that contains the 10 â€œhistoricalâ€� races of 1st Generation, and a complete rulebook, that includes all the adaptations to play with the new races. 10 REFERENCE SHEETS one for each race of 1st Generation. 1 RULEBOOK 2000 that includes all adaptations for next generations. 2 TERRITORIES laminated and linkable with the others, to start with your first battles. Each single race has an own, specific territory available on request. English rulebook and reference sheets printed in english in full color included. The greater italian luding convention with more than 50.000 visitors. Award gived by journalists, game shop dealers, artists and authors. Other finalists where games such as PokÃ¨mon or Dungeon & Dragons. A great honour for a self produced game like Warangel. The main Italian Luding convention specialized in wargames. Convention of Comics and Games, friendly and hospitable.